The Washington Nationals “Hot Stove” event is held annually for full-season ticket holders which makes this an exclusive event. 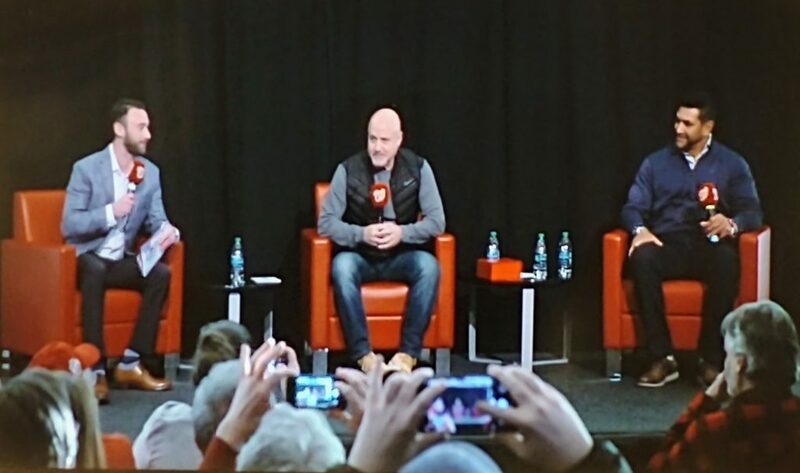 Typically the stage includes general manager Mike Rizzo, the team’s current manager (Dave Martinez), and the President of “Business Operation” (Vacant) and a member of MASN to moderate the event and tell a few jokes. 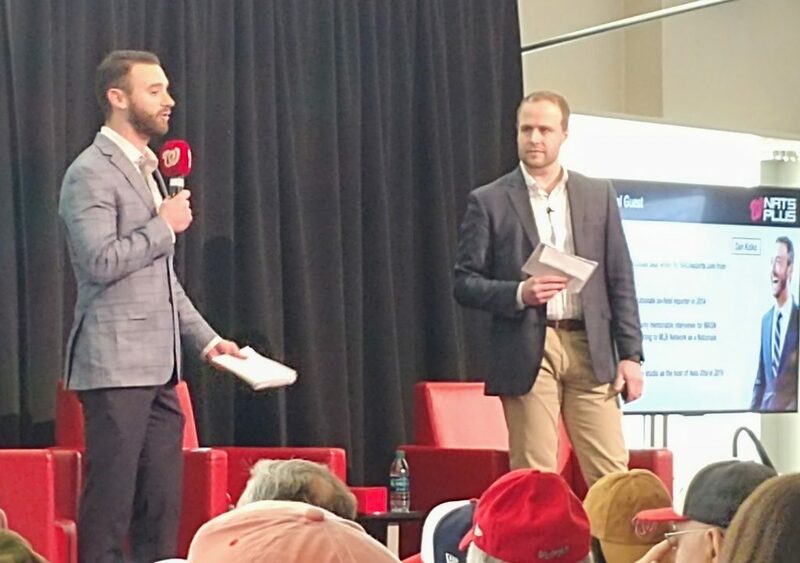 Since Valerie Camillo departed recently, Mike Shane who is the Senior Vice President of Consumer Revenue took Camillo’s spot and Dan Kolko from MASN was the moderator. As the crowd arrived, the video screen teased that there would be a mystery “special guest” and that got the crowd excited that it could be Bryce Harper — well, not only was Harper 2,061 miles away in Park City, Utah but his name was never even whispered on the stage during the entire event. The special guest was Dan Kolko who was just promoted to take Johnny Holliday’s spot and will be joining the newly hired Bo Porter to form the MASN pre-game and post-game duo. We had four writers in attendance for the event as well as several regulars on the site who all contributed to this piece as they provided photos, videos, and some inside scoop. Do you remember the article where we posted up sample questions for Rizzo/DMart? None of those questions were asked directly during the Q&A portion of the event, but the baserunning issues were discussed. After the event, the question about “naming rights” was answered that the team is still trying to “find the right fit”. That was it. Only two of the ten poll questions we posted got answered. Nothing on Bryce Harper. Most “Hot Stove” events give us some “inside information” like last year when we learned that A.J. Cole would be the fifth starter. Shocker, Rizzo and DMart made no mention of a fifth starter and the names of Joe Ross and Erick Fedde were not mentioned once in this year’s event. There was no breaking news during this event, but after reviewing the videos of the event, there was some new information and an apology of sorts about Sammy Solis who seemed to be either in every game or warming up every game for large segments of April and May. That quote was the shocker of the event. It might be as close as we have ever heard a manager publicly apologize to a player. We wrote about the over-use of Solis often. There were times that he was up throwing in the bullpen six days in a row, whether or not he entered the game and Fangraphs and Baseball Reference do not keep statistics of dry-humps in the bullpen, but it was nice to hear Davey Martinez acknowledge this. The other interesting revelation was Mike Rizzo speaking to building a championship team begins with making sure you have a 90+ win team on paper which he has accomplished ever year since 2012 although when paper meets the road the pencils sometime break like last year when they fell short of 90+ wins. They did not mention “contact hitting” as a tenet, however, the issues with contact hitting was mentioned during other discussions and specifically by Dave Martinez when he described the issues with Michael Taylor and Wilmer Difo. Another tidbit that came out of the discussion was that Dave Martinez has spent most of his winter in Washington, D.C. with considerable time sitting in the analytics department going through data and video. It is amazing what you can learn from the analytics, but also some “old school” discussions with the players with a simple question of “What worked for you and what did not work for you” in 2018. One issue we still see in sports is this stigma that you have to tough everything out. If you complain, you’re a wimp is part of that stigma so players gut it out and the end result is usually they play worse. Such was the case with Brian Dozier last year as he played through a bone bruise in his knee. Part of being a “player’s” manager is getting through to these players that we play with our best nine in the lineup not eight guys and one who is gutting through something that will keep him at 60%. Both Rizzo and Martinez proclaimed they will play the best nine in the line-up. Is that a new proclamation or just what you say to pander to the audience who has seen this team play veterans who needed a few more days on the bench because they were banged up? Martinez stressed there would be days where the team won’t hit in spring training, and all they will work on is fundamentals of baserunning and defense. The team was poor on corner outfield defense and at catcher and second base where the Nationals did not rank in the top half of defense. Both Mike Rizzo and Dave Martinez spent time giving positives about the players who were acquired so far in the off-season, and Dave Martinez made mention twice that he did not think Mike Rizzo was done with acquisitions. As far as the roster they have in place, the weak points seemed to point to Michael Taylor and Wilmer Difo who were questioned by someone in the audience as to whether they were good enough players to come off of the bench. One of the reasons for the sterile discussion this year at the “Hot Stove” was due to all the questions except for one were pre-submitted. Some of the questions were read off of index cards by Dan Kolko. Some of them had random first names only like “Steve” with no last name that might lead you to believe that some of the questions were sleight of hand index cards inserted into the deck to control the Q&A. Who knows. When the event was ready to wrap-up, Kolko asked if the audience had any questions, and they only took one question and it was a read dud. They successfully avoided any mention of Bryce Harper as well as the departures of Tanner Roark, Gio Gonzalez, and Daniel Murphy. There was no mention of the payroll or the CBT cap. There was no mention of who the fifth starter would be like we learned last year. To go backwards in the program, it opened with Mike Shane who is the Senior Vice President of Consumer Revenue, and he took the spot generally reserved for Valerie Camillo. He got big applause as he showed the new bobbleheads and discussed how they got a lot of input from Juan Soto who is the first bobble of 2019. Soto wanted a smile because he said he is always smiling. Shane said he does not smile during his swing but the team made the adjustment to the final mock-up before production to create the smiling Soto. Add to that the “Jeter-esque” Trea Turner and the first in the Marvel series a Captain America Ryan Zimmerman. Shane has been with the Nationals since just after the 2005 season and is one of the longest tenured employees. He played baseball at Mary Washington College and two years ago completed his MBA at Georgetown. His ideas for the future of the business side of the Nationals is excellent. He started in ticket sales and worked his way up. From people who I have talked to, the feedback is he can improve the fan experience, and fans should see much improvement this year including new seating in many sections and improved “Wi-Fi” but we will see about that. 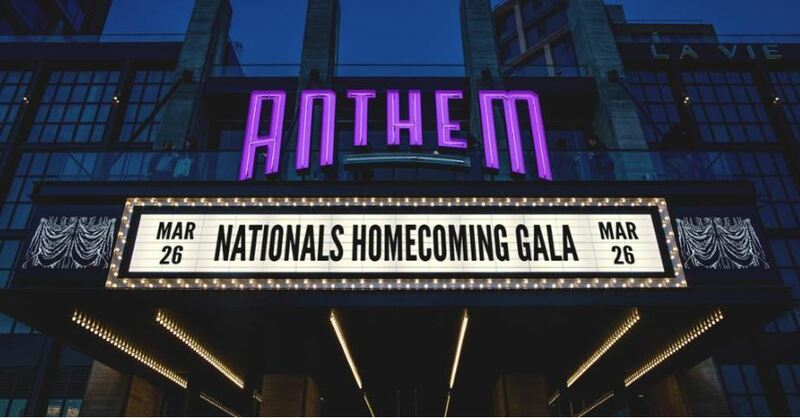 One of the best announcements was that the Nationals Gala would be moved on the the calendar from mid-season to the end of March. While the gala is always great, the even has a flawless streak of Nats losses the next day. This year’s gala will be held at “The Wharf” inside the The Anthem on March 26th. Players will get to dress in their trendiest clothes “cocktail chique” as Shane called it, and he described that as clothes a player would wear on the red carpet for an All-Star game. The Nats Plus ticketing will be moved to the Ballpark App. If you don’t have a smartphone, tickets can be printed out on paper. Season ticket holders will have credentials which is more of a status symbol that they can wear on a lanyard and the final artwork is not completed yet. There are also new concessions such as La Cassita, Bao Bao, Taco Caminando, and others. Onto the 2019 season and thank you to everyone who contributed to this report. Please contact me if you would like for me to add anything. This entry was posted in DaveMartinez, Feature, MASN, MikeRizzo. Bookmark the permalink.